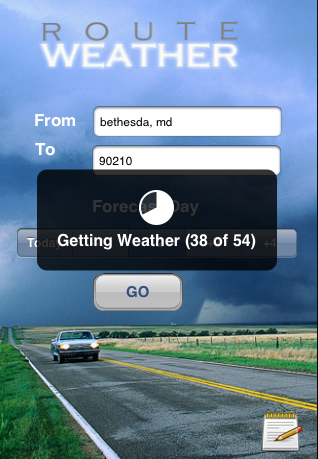 DrivingWeatherViewController.h/m: This is the main program. It is responsible for bringing up the first screen, accept user inputs and then invoke Google's secret APIs to get driving directions and weather along the route. It subsequently invokes code in my next bullet point that displays all the retrieved data in a nice, friendly table. CustomCell.h/m: This is used by WeatherTable to display a custom table cell for each row (if you see the third screen image, you will notice we have 3 sub-rows of data in each TableView Cell along with an image on the right. I will not be explaining how to use the HUD. For that take a look at my other tutorial here. // Created by Arjun on 10/29/10. // Copyright 2010 Hughes Systique Corp. All rights reserved. We are going to use a specific data-structure that is provided by MapKit.h called CLLocationCordinate2D. It is just a convenient structure to store a lat/long value. The variable HUD contains the HUD activity indicator. escapedFrom and escapedTo are basically 'sanitized' versions of the input with properly escaped sequences for special characters. For example, "Bethesda MD" needs to become "Bethesda%20MD". This is because we will be passing this as a URI parameter to google and it needs to be properly escaped to be able to do that. tableButton - well, as a matter of convenience, I've added a small button at the lower right that displays the last resolved weather condition along a given route. The logic there is that you may want to see it again, and re-computing it everytime is costly. So all you need to do is hit that button, we be show the previous table of weather along the route that was displayed. How thoughtful of me, wouldn't you say? // This is the main function. goPressed calls this to actually start the entire XML GET/parse etc. drivingURI is the base URL string that we need to invoke for Google to return the XML response (explained below). So we are setting up here - we display a HUD saying we are working on it, and then plan to pass the from and to values to this URL and fetch the responses (explained later). b) Each 'via point' is encapsulated in a <leg> tag (in our app, there will only be one 'leg' of the journey - from start to finish. If you instead did A to B to C, then A-B would be one leg and B-C the other. d) Inside each step, you have a lat/long for the starting and ending point. // I suppose I really should be just deleting all rows.. The appDelegate variable is just a convenient method for us to exchange data between different classes. It may not be a good design practice, but heck, good design requires intelligent thinking and I'm just slapping code together here. I don't claim to be an intelligent thinker. Basically, drivingWeatherArray will contain the parsed weather conditions for the route and it will be shared between this class and the WeatherTable class. So here, we initialize the array, and then use an excellent open source, fast XML parser for iOS called TBXML. We pass it the driving directions URL that was composed using the base URL and the user input. the TBXML initWithURL instantiates a TBXML object, fetches the data in that URL and returns it to the directionParser variable. We now need to walk the XML chain from here. TBXML is super easy to use and its instructions are really really simple. If you can't figure out how to use it from my code, go to their website and read about it. Next up, now that we have a XML document with the entire driving directions, we need to navigate down to the "route" tag, then get to the "leg" tag within in and then iterate though each "step" tag within it. Note that I've taken shortcuts - I know for sure there will only be one "leg" tag, so I don't bother looking for others. I just focus on the series of "step" tags inside the one "leg" tag. Once I have the starting pointer to the first "step", I iterate till I reach the end. For each iteration, I get the 'lat/long' for the start location as well as the 'lat/long' for the end location. Obviously, there will be many lat/longs for one 'city' or 'zip' and we need to filter them out. We will do all that later. For now, we use TBXML to quickly iterate through all the start/stop lat longs and stuff them into a "coord" array. That's all we need from the directions XML response. A list of lat-longs along the driving route. Now let's get to the google weather APIs to work the next part of the magic. // 1 after 2*cnt operations are completed. MBProgressHUD class considers 1 to be complete. 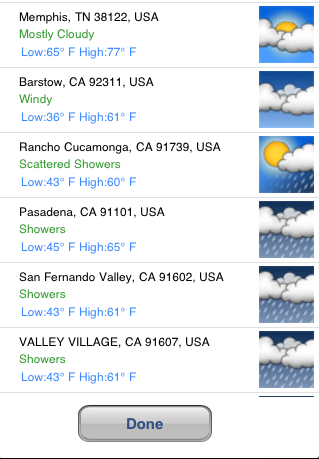 For each lat/long in our array, we need to pass that lat/long to the google weather API URL to get its weather. This is a time consuming operation, so we display a HUD. We also use a Pie-chart HUD display that MBProgressHUD offers so the user can visually see how much more of parsing is left (Just as one example, driving from MD to CA involves 84 different steps, which means we have to call the weather API 84 times, plus, reverseGeoCode API (coming up later) another 84 times to get city names. So really, the pie chart doesn't just look cool. It serves a purpose. 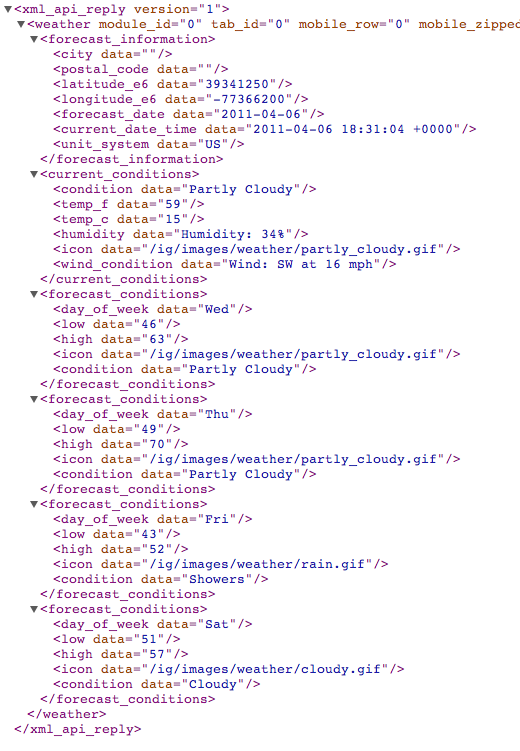 The variable weathercoord contains the google weather API URL along with the lat/long we need data for. Like before, we use the trusty TBXML class to walk though the XML API we explained before. A minor nit - before you parse, look for a tag called "problem_cause_data" - if it is part of the XML, parsing failed. So before we burn and crash, check it first. If it was returned, something got foo bar'd. Now we need to figure out which weather data is of interest to us. That depends on what day the user selected in the segmented control (day variable). If the user selected "Today" then we need to parse the "current_conditions" tag. 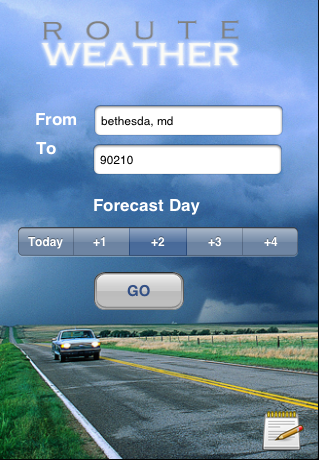 If not, then we need to walk through the "forecast_conditions" tags, once for each day ahead chosen. Right, so the code above walks through the XML and picks up the current temperature ( if current day is chosen), or, the forecast high and low for a forecast day. We also pick up the image URL (its in the "icon" tag in the XML output). All of this goes into a data structure (wdc) for use later. as an example. Suffice to say, what we are looking for is the "postal_code" tag with a "formatted_address" tag inside it. Thats the value we want to display. So the next piece of code walks this chain and looks for it. Right, now we have the city and zip for that lat long. What we now do here is check the drivingWeatherArray object to see if this city+zip is already part of our list. If it is, its a repeat, so just skip and don't add, else add to the object array. And finally, display all of that data in a nice TableView. Done! The "remaining tail" of the main code - usual iphone skeleton code. // Created by Arjun on 10/31/10. We are using a pointer to the appDelegate class to share the driving list Array between the two classes as explained earlier. Also, each row of the Table will be filled with a custom cell which will accomodate an image and two rows of data. If you look at my sample screenshot for the results screen, the first row is "special" - it displays a copyright message attributing the data to google and my app icon. So we need to ensure that we use a different identifier in "dequeueReusableCellWithIdentifier". If we did not, then iphone will start sharing memory of that row with other rows. that will mess up formatting the moment you scroll around because it will overwrite formatting data of the header row with the other rows (since you told it that it can be reused if needed) - try it out. So we keep them separate. Next up, we iterate through the drivingWeather Array and set the table cell fields to the right values. Loose explanation, but I think its pretty simple what is going on up here. No explanation needed above -standard stuff. // Created by Arjun on 9/29/10. CustomCell is a XIB file I created in Interface Builder. It has a label to display the city, forecast, temperature and an imageview to show the weather icon. Grab it from HERE. Hope it helps you. I try your code but when I go to two cities, the application crashes and closes as soon as I press GO? is this normal? Can you help me or tell me if I forget something? Hi, the code I posted does not check for null parser returns in several places. I fixed that later, but did not upload the new code. Please check the input you are providing - if its an invalid input, likely it is crashing because the parser was not able to parse the returned response. I don't know why I cannot join it. Is there anybody else getting similar RSS issues? Anyone who knows the answer will you kindly respond? Thanks! !